Here is another post in a brand new blog series - called 'From the Archives'. These will be previously posted blog posts that I feel are still relevant for some reason or another. It will always be a post from the same calendar month as we are in or it could be some of my favourite flowers from the same season, that still lifts my spirit. 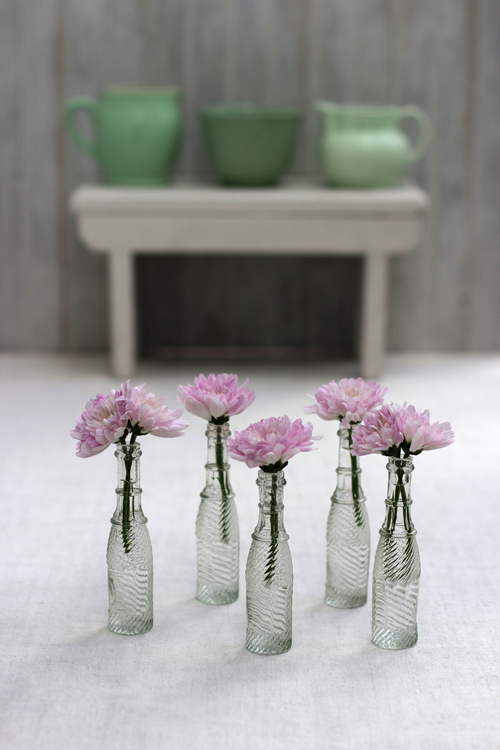 This series of blog posts - called 'Tiny Blooms - are about small flower arrangements. Small - might be the size of the container or it could be the size of the flowers or the amount of stems in each container. 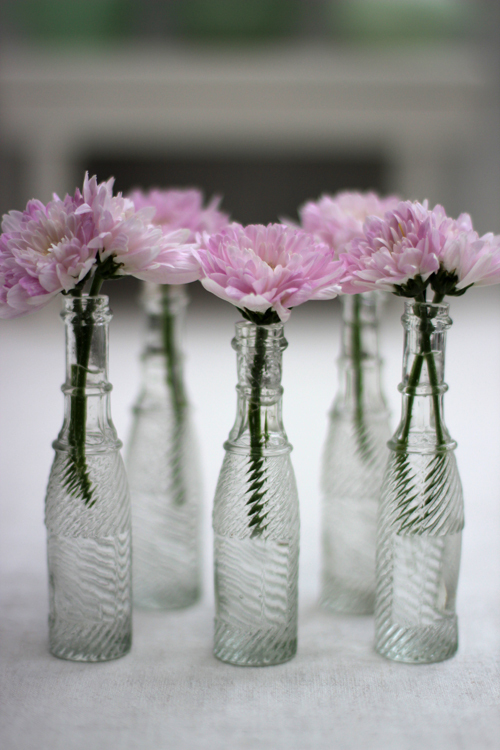 It can also be that the arrangement is minimal both in presentation and that it's simple, quick and easy to do. Apart from that there are no other strict rules - I'm allowing myself a lot of creative freedom! 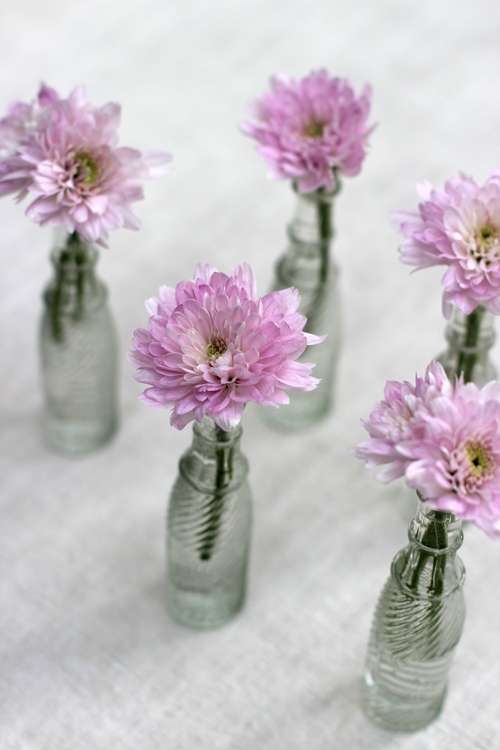 Chrysanthemums, pink and vintage bottles - some of my favorite things! I found some pink spray Chrysanthemums - 'spray' just means that they are multi-stemmed - and I cut some stems down to their single flowers. 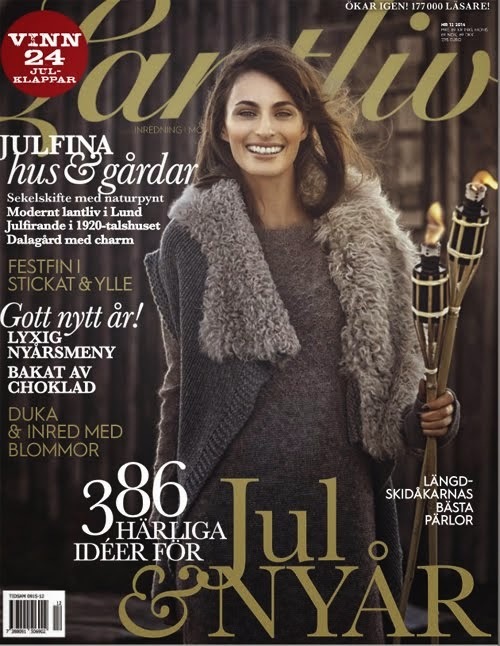 My daughter and I spent a few hours at the Country Living magazine Christmas Fair last week. There are some lovely stalls that I go back to every year. On one antique stall I found these adorable mini vintage bottles - bought five and I had an instant little collection. 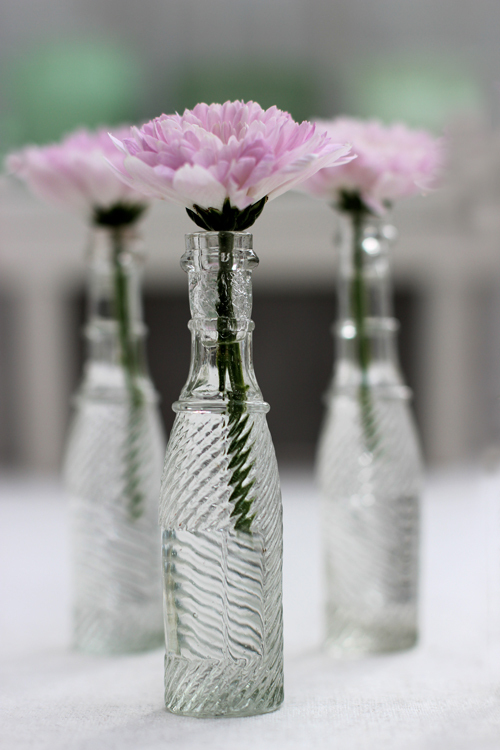 Combining the two makes a charming display - the bottles are only just over 11 cm tall - so they are perfect for one or two stems. To photograph them I have displayed them on an old French linen tablecloth - but a small collection like this works very well on a little tray - keeping them together gives them more impact. Chrysanthemums are available all year around but are particularly welcome at this time of year when cheep flowers are sparse on the ground. Here in London its raining, its dark early and very windy. Well, the pink colour reminds me of spring!! Ha nu en skön helg vännen!